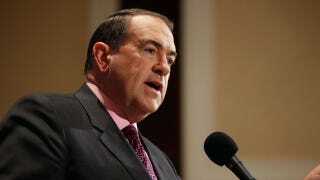 In a speech railing against Iowa's gay marriage law, potential Republican presidential nominee Mike Huckabee addressed the crowd like a southern baptist minister while urging them to remember that it's Adam and Eve, not Adam and Steve. "This battle is one that pits good against evil." "Real faith is tested. It's not easy. And I know there are always those who say but if we take such a stand for righteousness. If we do hold to the idea – as you did in Iowa, and God bless you for it – then marriage still means that a man marries a woman and remains faithful in a partnership for life." "If we truly cherish and believe that, and uphold that, I assure you, it will not always be popular and we may pay the price for it. And there may be some even here tonight who will say, will that make some people mad? And the answer is yes. Will it get me in trouble? Yes. Will it perhaps even cost me my job? Possibly. But if we gain the world and we lose our soul, will you please tell me what it has profited us?" At least Huckabee did manage to get one thing right. If ever there was a battle that could potentially be considered as one that "pits good against evil", it could very well be the ongoing fight to allow people in loving, long-term partnerships to be with one another if they so choose.